London Footsteps is run by David Williams, who is a qualified and registered City of London guide and lecturer. He is the guide on all the walks, and he presents all the talks! London Footsteps is his passion and is run as a small and friendly way to enjoy a “stroll through London’s history”, specialising in low-key events which are particularly suited to senior or retired walkers. 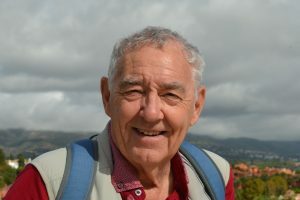 In addition to the City of London qualification, David holds history degrees which give him a strong and broad historical base on which his excellent walks and talks are based. As a result, London Footsteps provides tours and talks that are not part of the familiar tourist trail, and you will not find them anywhere else. So if you are looking for a new perspective on London, then London Footsteps is the right choice. London Footsteps offer tours in familiar areas of London, but NOT “Jack the Ripper” walks or extended tours of St Pauls or the Tower of London!